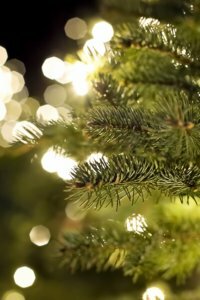 Home : Blog : Science/Nature : O Christmas Tree! Did you happen to have evergreen in your home over the holidays? Whether it was a tree, a wreath, garlands, or something else, they don’t have to be put out for garbage pick up. Get outdoors with your children and get creative with exploration and recycling. The easiest thing to do with a Christmas tree is to set it in a corner of a backyard (if room allows). There are many different types of birds and animals that will use the branches for shelter. You can put a bird feeder in or under the tree to attract winter inhabitants. In the spring, the bare branches (after needles have fallen off) can be used as a natural trellis for flowers and vegetables. Garlands and tree branches can be cut and laid over garden plants and bulbs to insulate from wind and cold. Wreaths can simply be set around plants for protection and mulch. What is the age of your Christmas tree? Use a saw to cut straight across the trunk and count the rings. Most Christmas trees tend to be eight to ten years old when they’ve been cut. How old is yours? Working as a family to reuse natural items not only gets us outside, but also shows children how easy it can be to recycle and be environmentally-friendly. You may be surprised by all of the amazing things you can do with these former decorations!